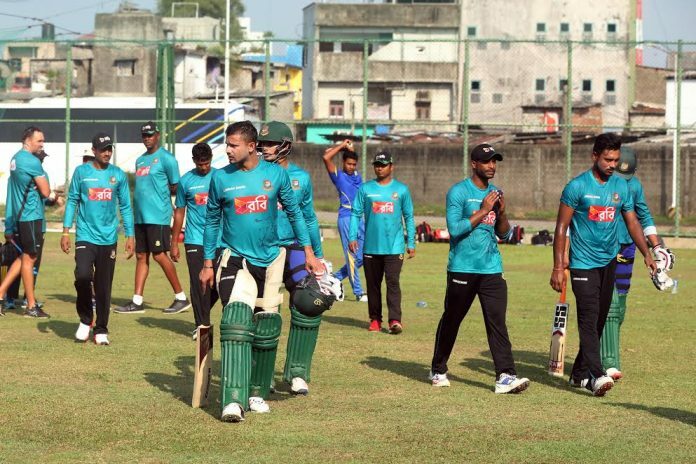 Bangladesh lost by 2 runs in the only practice match against Sri Lanka Board President XI at the Colombo Cricket Ground before One day Series. Earlier Mashrafe Bin Mortaza won the toss and elected to field first. Taskin Ahmed gave the first breakthrough for Bangladesh by dismissing Dilshan Munaweera on 24. Then Kusal Perera and Sandun Weerakkody added 114 runs in the 2nd wicket. Sandun Weerakkody was finally gone for 67. Kusal Perera was retired out on 64. Milinda Siriwardana was the next man to be dismissed by Sunzamul Islam on 32. Dhananjaya de Silva was run out on 52. Mashrafe Bin Mortaza and Abul Hasan shared the last 2 wickets as SLBP XI finished their innings with 354 for 7. In reply, Bangladesh had a poor start as they have lost Imrul Kayes in the first ball of the innings. Soumya Sarkar and Sabbir Rahman added 116 runs in the 2nd wicket. Soumya was gone for 47. Soon Chaturanga de Silva picked up the wicket of Sabbir who scored 72 from 63 balls including 11 fours and 1 six. Mushfiqur Rahim came at number 4 and scored 20. Mosaddek Hossain and Mahmudullah made a partnership of 60 runs in the 5th wicket. Mosaddek was gone for 53 runs from 50 balls. Next two batsmen Shuvagata Hom and Sunzamul Islam lost their wickets in quick succession as Dhananjaya de Silva picked up the both wickets. Then skipper Mashrafe Bin Mortaza added 101 runs in the 8th wicket with Mahmudullah. Mashrafe made a quickfire 58 runs from 35 balls with 4 fours and 4 sixes. After his dismissal, Mahmudullah and Rubel Hossain tried but only fell 2 runs short from winning the match. Mahmudullah was unbeaten on 71. The three match ODI series between Sri Lanka and Bangladesh will start from 25th march.